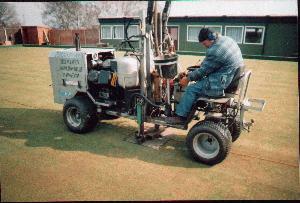 ?The aeration of bowling greens is absolutely essential?, says Neil Squires, Southern Regional Agronomist for the STRI. ?In terms of priority it comes second only to mowing. It?s the same for golf greens. Aeration should be executed all year round in one form or another.? Under normal conditions, Squires recommends spiking to a depth of 3 to 4 inches once a month during the growing season, rising to every 10 to 14 days in the autumn. ?During the winter the greenkeeper?s skill and common sense will tell him when a weather window presents itself and he can take aeration machinery onto the green without marking it,? he continues. ?Changing the spiking and slitting depths, will reduce the possibility of compaction forming at the machinery?s deepest point of penetration, but not every bowling club has the resources necessary to do this.? In cases of severe compaction and thatch, Squires recommends hollow tining during renovation at the end of the bowling season. Deep, compressed air treatment could be considered in situations where severe compaction has built up over time, and routine aeration has had little or no effect.? Hoddesdon Bowls Club Rosehill, in Hertfordshire has had just such an experience. The five links green, cut out of a south facing hillside 60 years ago, with a sixth link added in the 80s has been suffering from surface water retention and poor grass growth on the area nearest the hill (approx 1/3rd of the green) ever since the greenkeeper, Bill Lartice arrived in 1993. A mixture of deciduous and coniferous trees growing to heights of up to 60 ft, and situated10 to 15 yards further up the hill, throw shade on this side, especially the clump above one corner, where the hill rises sharply. ?If the hill slopes away from the green it?s possible that the tree roots will grow down into the bowling green?s ditch, and up again onto the green itself looking for water,? comments Squires. Mr. Lartice realised this a couple of seasons ago, and along with his hand-picked members? work party, extended the depth of the ditch on this side, cut through several large tree roots and inserted paving stones in a vertical position at the bottom of the ditch, to stop the roots spreading. ?I recommend chopping the trees down,? says Squires. The problem in this case is that the trees are growing on someone else?s land. Suffolk based Terrain Aeration, who were called in to treat Hoddesdon with their hydraulic terralift machine, Airforce, found that compaction was at its most severe along the tree shaded side nearest the hill. ?The third of the green that was both shaded and wet was also compact at depth,? reports Terrain Aeration?s MD David Green. ?Working to our usual line from one side of the green to the other we had to increase the air pressure from 10 to 15 Bar as the ground resistance became greater. The area furthest away from the slope had subsoil conditions which were considerably softer.? ?I suspect, with a green of this age, that a layer of clinker was originally laid straight on top of the subsoil,? comments Squires. ?If this is the case, then Airforce would be hammering it?s probe one metre down, almost straight into the hillside. The other side of the green will have been built up to this level, resulting in much softer, less compacted conditions.? Both Green and Squires agree that this part of Hertfordshire is probably made up of chalky boulder clay. fissures, which were filled with dried, milled seaweed on the final air blast. As well as adding nutrients, the seaweed will swell on contact with moisture and help keep the fissures open. Bill Lartice?s work party filled the probe holes with Lytag leaving 100mm space at the top, which was filled five days later with top dressing and grass seed. ?Links one and two all down the shady side have always been the wettest, but hopefully we?ll now get the water away,? says Lartice. ?I?m pleased with what they?ve done. You can actually see the air move into the ground. When you consider the size of the machine and the force employed to perform the operation I?m amazed that it hasn?t marked the surface. We?ve had quite a bit of rain since, and the green has improved. So far so good - I?m not expecting miracles.? Latest News Hoddesdon report that the green is now draining freely and water no longer stands around in puddles on the surface despite some very heavy rain storms.